Dunfermline Athletic put injury problems behind them to sweep aside in-form Kilmarnock at East End Park. The Pars' Scott Wilson almost scored an own goal and Colin Nish came close before Scotland midfielder Barry Nicholson fired the home side ahead. Billy Mehmet had set up the chance and the striker drove home the second following a Craig Brewster pass. Wilson headed in after the break before Gary Wales drove home for Killie and Brewster drilled in the Pars' fourth. Dunfermline had started without eight first-team regulars, with Davie Hay making three changes from last weekend. Out went Richie Byrne, Andy Tod and Thomas Butler and in came Craig Brewster and Darren Young and 17-year-old defender Greg Ross, who was making his debut. Kilmarnock manager Jim Jefferies brought captain Gary Locke in to replace defender Freddy Dindeleux. The visitors threatened first and Pars' defender Scott Wilson stooped to head a Danny Invincibile cross into the six-yard box just over his own bar. 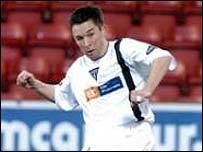 Former Dunfermline striker Colin Nish looped a near-post header over the bar following a corner. Killie goalkeeper Alan Combe pulled off a fine double save, first from Ross's angled drive from 12 yards and then to deny Brewster from the rebound. Dunfermline took the lead after the half-hour, Scotland international Nicholson finished off a sweeping move from 12 yards following a pass from Mehmet. Combe touched round the post Nicholson's drive from 25 yards. The second goal arrived after 38 minutes, Mehmet picking up a great Craig Brewster through ball, turning inside Gordon Greer and driving the ball through the clutches of Combe. Unmarked Wilson headed home a Nicholson corner to make it three after 57 minutes. Mehmet should have made it 4-0 when he was through one-on-one with Combe, but the Killie keeper guessed right to smother the striker's low drive from 16 yards. The visitors pulled a goal back through substitute Wales after 80 minutes, when the striker bundled the ball into the net on the line after goalkeeper Derek Stillie fumbled Invincibile's powerful drive. Brewster restored the margin of victory when he latched on to a Mehmet header and hammered a volley past Combe from close range. Dunfermline: Stillie, Nicholson, Scott Wilson, Labonte, Scott Thomson, Donnelly, Mason, Darren Young (Bradley 79), Ross, Brewster, Mehmet. Subs Not Used: Langfield, McKeown, Campbell, Craig Wilson, Scullion, Dunn. Goals: Nicholson 30, Mehmet 38, Scott Wilson 57, Brewster 90. Kilmarnock: Combe, Greer, Lilley, Ford, Leven, Dargo (Dindeleux 45), Locke, McDonald, Johnston (Wales 64), Invincibile, Nish (Murray 64). Subs Not Used: Smith, Fowler, Joly, Naismith.